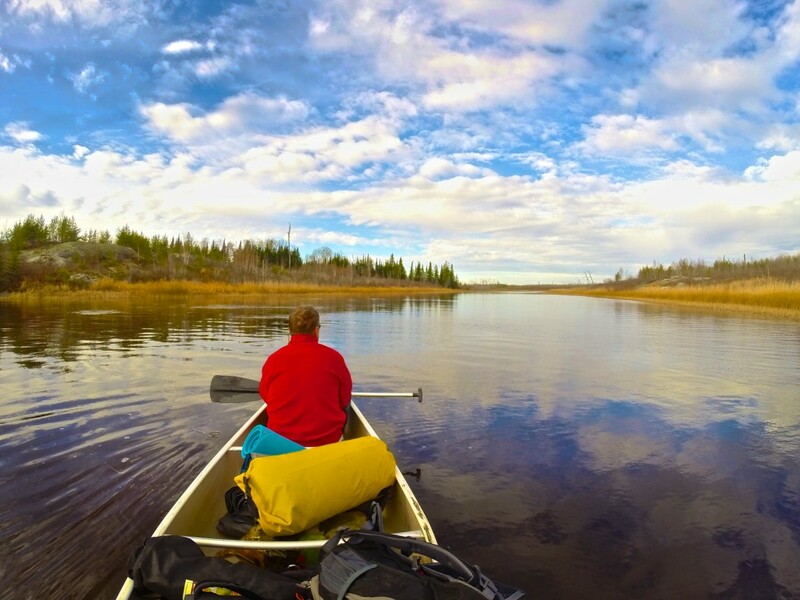 This story originally appeared in SCMP’s Post Magazine as “Canoeing along Canada’s Manigotagan River” on Feb 1, 2015. I am still trying to get comfortable in my seat and come to terms with steering the canoe when my brother points to the sky. A bald eagle with a two-metre wingspan soars overhead, its brilliant white head twisting back and forth in search of prey. The eagle circles us in a lazy loop and then, with two smooth strokes of its wings, disappears over the treetops. When I come back down to earth, I find that our canoe is drifting down the Manigotagan River sideways – which is bad news, because it’s getting dark and we have yet to find a campsite. The Manigotagan is only a few hours north of Winnipeg, the capital of Manitoba province. But we could just as well be a thousand miles from civilisation as the river carries us through the Canadian Shield, the massive rock craton that forms the core of the North American continent. This is rolling land with rock outcrops that were rounded off by the last ice age, leaving room for boreal forests and marshes. Maps show long, narrow lakes, all running in the same direction, torn into the earth by the slow claw of ice. Atop each rocky outcrop, at every roaring waterfall or quiet bend where the river slows, history invites us to imagine. 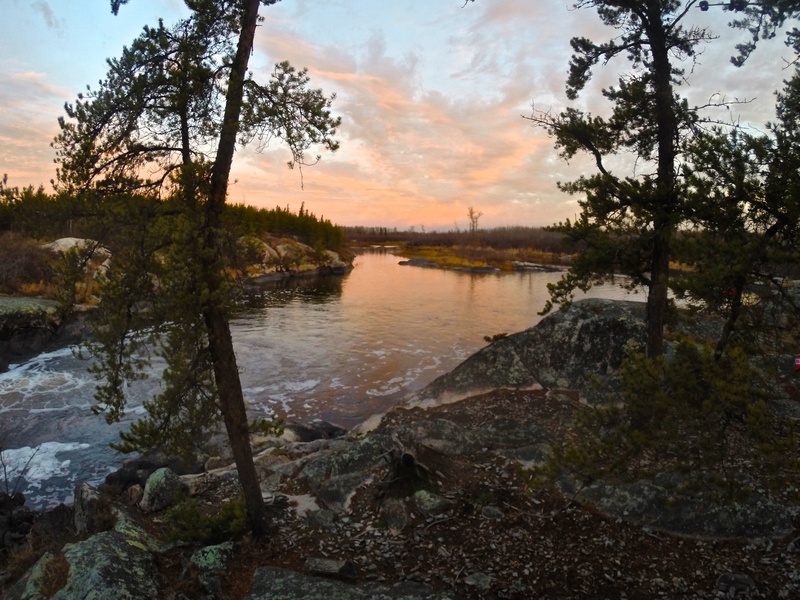 To envision humans on this river thousands of years ago, proud natives traversing their land; the first European fur traders and voyageurs, men who came searching for their fortunes in Canada’s wilderness, toiling their way up and down this watery highway. A nearby archaeological site proves that human habitation of the Manigotagan area began at least 2,000 years ago and use intensified when aboriginal people underwent a cultural shift from relying on grassland hunting to life in the forest, where they survived on fish, small mammals, waterfowl and wild rice. When white men discovered the forests’ bounty, they set up the Bad Throat fur-trading post at the mouth of the river, on the eastern shores of Lake Winnipeg. The river became an important trade route for trappers and their canoes, and they were soon followed by loggers and miners. Rusting iron machinery, empty trappers’ cabins, shards of pottery and tent circles all mark chapters in this river’s history. That trading post has become the town of Manigotagan, which continues to rely on nature, with forestry, commercial fishing, wild rice harvesting and tourism being the economic mainstays. The river is now travelled by weekend canoeists looking to connect with nature. 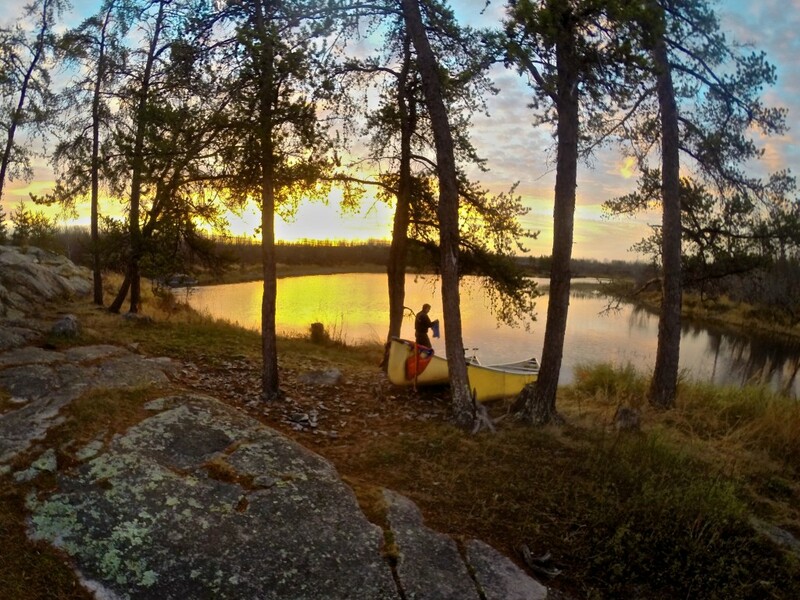 The longest canoe trips stretch to 102km – five to seven days of paddling – and the last 70km of the downriver journey has no exits. After 32km, you’re committed to a week-long journey. We start at the mouth and work our way upstream. Just as daylight begins to fade, we come to a thundering set of waterfalls. There are dozens of falls and rapids along the river, most of which must be skirted. This requires us to unload both two-man canoes and carry everything on forest paths that pass the dangerous water: a process called portaging. At Old Woman’s Falls, the river appears to be trying to dislodge a small island. The water sweeps around the rocky obstruction before roaring into narrow chutes on either side. We gingerly land our canoes in eddies only metres from the maelstrom and drag them up to safety before scouting out a campsite. The island is one of the most popular campsites on the river but it is late in the year and no one else is braving the chilly weather. Or perhaps the ghost of the old woman whose death here gave the falls their name has scared them away. 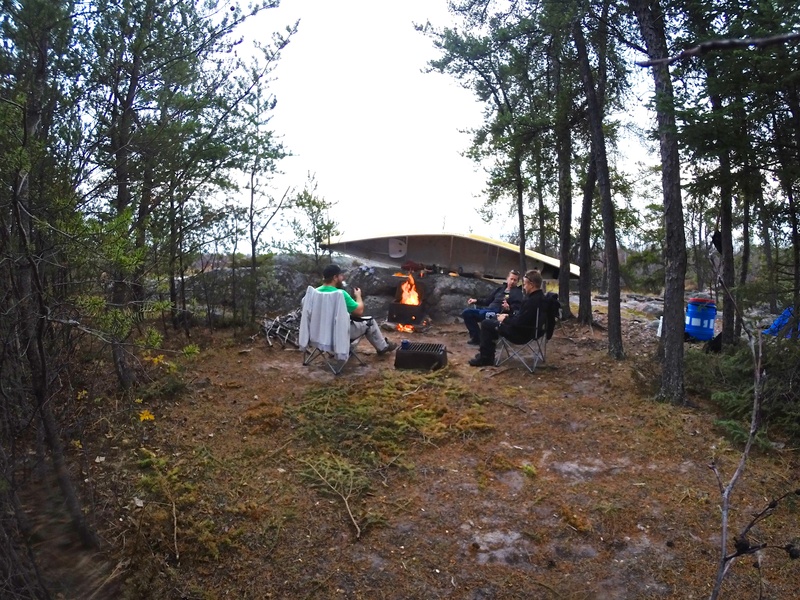 Firewood collected and tent erected, we are soon sitting around a crackling campfire with dinner simmering in a pot. A few streaks of light remain in the sky and the falls are now just a flash of white in the dusk, a steady clamour of water bashing itself against the rocks. The topography along the Manigotagan ranges from sheer rock faces topped with craggy Jack pine and a thin skin of rock-tripe lichen to thick green stands of balsam poplar, green ash and elderberry. Our small island is covered in towering pines, the reflection of the river glinting through gaps between the trunks. And there is wildlife; the entire river lies within protected parkland filled with, among other creatures, moose, black bear, wolf and woodland caribou. Beavers can be seen working along the banks. We sit, passing a rum bottle in circles, until we have depleted our wood pile and the fire fades. We give the dishes a hurried scrub in the frigid water, the clattering of pots echoing across the river. We crawl into our tent, hoping that whatever the large brown furry thing we saw earlier was, it won’t be brave enough to swim across Old Woman’s Falls. The next day, we continue upriver, leaving the campsite set for our return. We spend the morning paddling over gentle rapids. At midday we find a rock outcrop overlooking Big Skunk Rapids. The others gather wood while I mix up a batch of bannock, the simple flat-bread that is the traditional mainstay of native American cooking. We crouch around the fire, watching the dough turn a golden brown flecked with ash. After lunch, we turn back, now riding with the current. My other brother, in the second canoe with his son, eyes up a low set of rapids that we portaged around earlier. “I think we can run those, eh?” he says, as much a challenge as a question. His canoe slips into the current, dips, bobs, is caught in a spray of water, as we hold our position in an eddy. I can see only heads. A few moments later, a drenched duo are treading water, one at each end of the swamped canoe, gasping with shock at the cold. We do as we’re told, less careful about the canoe’s paint than we were on earlier portages. The pair roll into our canoe, sodden and shivering, rocking the craft until I worry that we will all be swimming soon. Back at Old Woman’s Falls, a fire leaping through the grating and clothing strung from the trees, the story is retold with added flourishes, a gentle nip of warning from nature. The next day we break camp and turn for home, letting the current slowly pull us towards Lake Winnipeg. The sun breaks through the clouds and remains free, bringing out the blue reflection of the sky on the water, the emerald green of trees and moss. As we approach our landing spot, where pick-up truck, mobile phones and cluttered life await, what looks like the same bald eagle takes flight out of a poplar tree along the banks. Once again it circles and eyes us, as if tallying to check whether those who ventured into his hunting grounds have returned alive.